After seeing Simone share her top concealers on her Instagram a few weeks back, I was inspired to start pulling together a few of my favourites too. 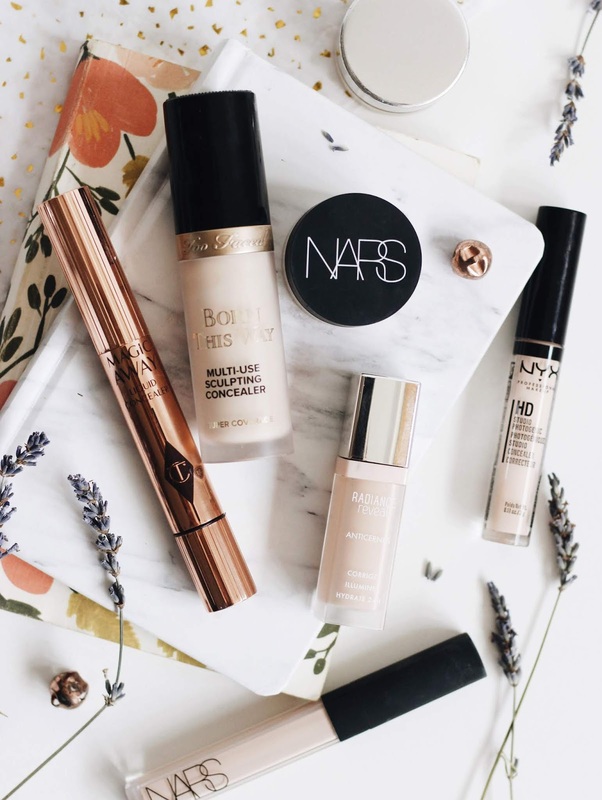 I've been trying out a couple of new additions, so I thought this would be the perfect time to share some of my go-to concealers. 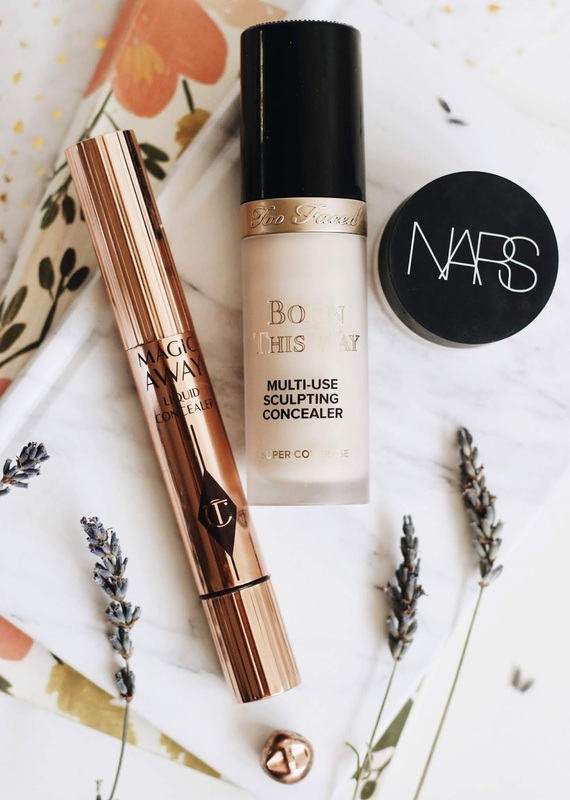 First up is a long time favourite of mine, the Bourjois Radiance Reveal which is a budget pick perfect for those looking to brighten the under eye up and covering any blemishes without looking cakey on the skin. The lightest shade is the one I use and although it isn't as light as I'd go if the concealer was of a higher, fuller coverage, it works as I tend to use this for a natural makeup look or when I just want to cover redness with no foundation. A concealer that works in a similar way is the Glossier Stretch offering which is one of my all time favourites despite being unlike anything in my collection. I tend to use this when I've got little makeup product on and I simply dab this on with a beauty blender over any blemishes that need concealing. It's a hard one to describe the texture and finish off as it offers a good amount of coverage, nothing too heavy nor light, but it never sets on the skin which wouldn't make it a very good pick for those oily days. It's a really no-makeup makeup product as it looks like you're barely wearing anything on the skin, but it's not my favourite when wearing a foundation as it doesn't do much in comparison. A new addition to my collection is the Nars Soft Matte Complete Concealer* which really reminds me of the Glossier one, but this one does set down on the skin. I was expecting the lighter shades to lean more towards the pinkier sides as most Nars base products do, but this one is fairly neutral. I use the Chantilly which upon deliberation, I should have gone a shade darker as I find this a little too light, but I'm sure it'll work better once the weather gets even colder and I start to lose my tan. I prefer to use this on blemishes or across redness on my face and if I use a Beauty Blender it has to be quite damp to make sure it blends flawlessly into my complexion. Under the eyes, I'm not so much of a fan because it separates a little bit under there and can look like it gathers a little once powder is applied. It's nothing a damp beauty sponge can't fix, but it's a tad annoying. Back to the more affordable options and one of the concealers I've repurchased many times is the NYX HD offering which delivers a great amount of coverage, but unfortunately I feel like it does run out pretty fast. Saying this at under £6, it's a hard one to complain about as it's on the right side of high coverage and I prefer it to it's regularly high end dupe, the Nars Radiant Creamy Concealer*. I would say just be away that towards the end of the tube, the colour will start to oxidise a bit more, so I would say if you're in-between shades, always go down one. I had high hopes for the Too Faced Born This Way Sculpting Concealer* as I'm sure you're all away by now just how much I adore their foundation of the same name too and I'm happy to say I wasn't disappointed. I haven't tried the Tarte concealer that this is often compared to, but the doe foot applicator makes it super easy to apply under the eyes and over blemishes with just a quick sweep. Just note that I find one pump into the tube is enough to do both my under eyes, redness and blemishes I have and if you over apply to your face it can be a little hard to blend into the skin, but that's pretty normal with concealers. Their shades tend to sway more towards the yellow undertones, so just be aware of that, but I find Snow is a little on the light side for me, but it'll no doubt match better as the months go on. It really stays put, offers amazing coverage and doesn't look unnatural at all - I feel like this could be a favourite in my makeup bag for the months to come. Last up in this round up is the Charlotte Tilbury Magic Away Concealer* which I have mixed thoughts on as I love the way it looks and feels on the skin, but the packaging needs to be mentioned. I've seen a few people say they prefer it when they've ripped the sponge off the top and I'm thinking I need to do the same as it's driving me nuts. It's one of the most messy products I own, but it really shouldn't put you off what's inside as it's amazing. It's super natural on the skin and despite thinking this would be on the lighter coverage side, it's rather deceiving as it delivers perfected skin in little time. All links are affiliate links. If a product is marked with a * it is a PR sample. Am I Stopping Beauty Blogging? Is This Mascara Worth The Hype?